How often we see unsung heroes of everyday life being rewarded or honored? Seldom right… but recently in conjunction with the festive of giving, Sunway Putra Hotel embarked on a mission to honor the deserving winners that had dedicated their life caring for their family or made it their mission in life to bring comfort to those less fortunate. These are heroes and heroines that deserve VVIP with 5-star treatment at Time To Give campaign @ Sunway Putra Hotel, honoring the selfless among us. It was a memorable night and proud moments for them and their loved ones. Aptly named the Time To Give Campaign, people were encouraged to submit the names and the reasons why their nominees deserved the VVIP treatment the Sunway Putra Hotel was offering through this festive giveaway. The beauty of this campaign was that anyone could be nominated; be it someone who had dedicated their life to caring for their family or someone who had made it their mission in life to bring comfort to those less fortunate. The winners were invited to spend the evening on 30th of December at the hotel enjoying a gourmet dinner at and gift giving followed by an overnight stay in one of the newly-refurbished Deluxe rooms at the hotel with their loved ones. And I was honored to be invited to experience and cover this event. The VVIP 5-star treatment and event began with Sunway Putra Hotel butlers picking up the winners from their homes. They were greeted by staff upon arrival at the hotel and the butlers accompanied them for the evening in true VIP style. Then dinner and drinks were served at the Sunway Putra Hotel’s Club Floor on the 35th floor with spectacular view of the KL city and accompaniment of an acoustic duo. Sunway Putra Hotel Executive Chef, Chef Rossham Rusli specially prepared the 5-course dinner for the winners and their loved ones too. 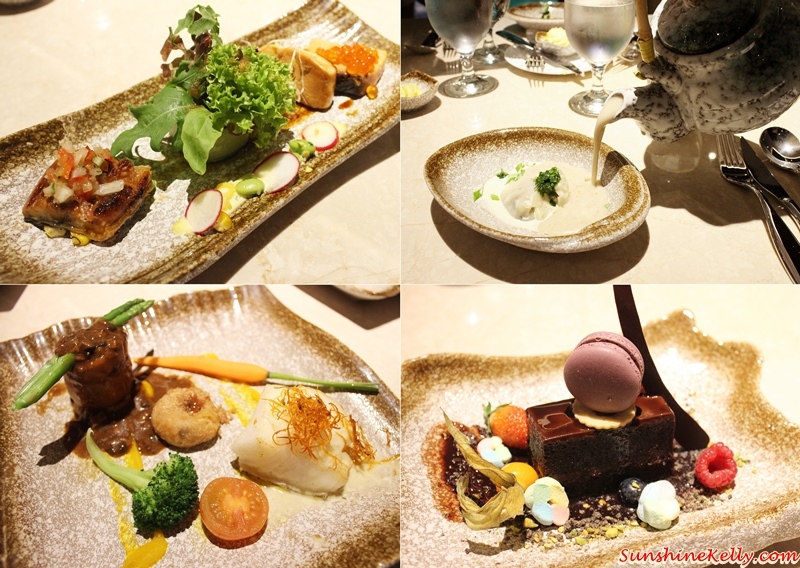 It was a gorgeously setup fine dining with the scrumptious dinner comprised of an appetizer of a trio of warm marinated salmon, butterfish and unagi teriyaki; followed by a creamy mushroom soup with portobello dumplings. The main dish was a combination of pan-seared codfish and chicken rolls and end with an indulgence of melted chocolate cake with fruits macarons and cocoa soil. During dinner senior hotel staff including the Cluster Director of Sales & Marketing, Mr. T.S. Cheah; Executive Chef, Chef Rossham Rusli; and Director of Food & Beverage, Mr. Bernard Krishnan, were on hand to ensure everyone felt like a VVIPs and looked after. “We at Sunway Putra Hotel wanted to take this opportunity to honour those among us who selflessly do things for others – a mother caring for her family, a sister encouraging a sibling, a child wanting to surprise a self-sacrificing parent, the volunteer who cares so much about society. These are the unsung heroes of everyday life who take it upon themselves to improve the lives of others,” said Mr. T.S. Cheah, Cluster Director of Sales and Marketing. Oh yes, after dinner the winners were ushered down to the hotel lobby where carefully chosen personalized gifts bought by the Sunway Putra Hotel concierge team based on individual personalities were presented to the winners. These are the deserving heroes and heroines that contributed so much to the society and also their family. I’m proud of you all. With regards to volunteerism, there can be no doubt that Ms. Wong is one of the most dedicated, selfless people around. She enthusiastically champions several different causes including environmental awareness, green living, animal welfare, teaching impoverished children, running mentor programs for underprivileged teens and helping NGOs involved with providing meals and basic necessities to the homeless. Madam Tea has spent her life being a caring, responsible mother and raising her family. Having hurt her leg recently, she is now in a wheelchair and cannot be as active as she would like and was nominated by her loved ones to show their appreciation for all her sacrifices and to cheer her up in preparation for her 73rd birthday. Since suffering a traumatic brain injury three years ago, 17-year-old Ashley has strived to regain the ability to do all the basic things we take for granted. Confined to a wheelchair, she has undergone incredible challenges and does so with her little sister, 9-year-old Zoe, mature beyond her years and constantly by her side, supporting and encouraging her. Ashley and Zoe were both nominated to spend the their VIP evening with their parents and grandparents. Mr. Chua is currently pursuing his postgraduate degree in engineering and also tutors undergraduate students. In addition to his own scholastic responsibilities, he voluntarily manages an association, which looks after the general welfare of students. Mr. Chua was nominated so that he could have some time off to indulge himself and prepare for the busy year ahead. Parents spend their life ensuring their children want for nothing and have the best they can offer. Sacrifices like giving up flourishing careers are made to stay home to look after young children, and it is always a wonderful surprise when children truly appreciate their parents, as was the case with this couple. Their daughter nominated them for the giveaway after a rough start to the year with her father undergoing major heart surgery, in the hope that a night of good food and 5-star service would end the year well. There can never be enough said about what mothers do for their families; not only looking after their own children but also aging parents. Mdm. See was nominated by her husband for the simple reason that she deserved a break to be pampered, unwind and to just get away from her normal routine. Dr. Seth has spent his life working hard and making donations to various charitable organizations. When someone spends his life giving to others, it is only fitting that sometimes he can get something back. Nominated by his daughter, her main aim was to surprise him and to show how much he was appreciated by everyone. Well, the event ended with everyone going back to our luxurious rooms. Since the hotel is in the city center, so we decided to went out for a drink in KL. It's so convenient plus the hotel is attached to the Sunway Putra Mall. The next morning after checking out we can go shopping. 100 Jalan Putra, 50350 Kuala Lumpur, Malaysia. After all the indulgence I need to burn off the calories. So I had a quick workout at the hotel well equipped gym the next morning before my breakfast the coffee house. Great job Sunway in recognizing the heroes. Hopefully more companies will come forward to celebrate the unsung heroes that we know. Kudos Sunway. Nice view of KL! Beautiful! What a meaningful event! The hotel looks good. Must bring my family for a staycation one day. So sweet of them for such a meaningful event!~ Great staycation u have there! Love the place so much after the make-over. Great initiative by Sunway Putra Mall. Ashley and Zoe Tan's story melted my heart! Such a good deed by the hotel, indeed! Congratulations to all the winners, you deserve all these luxuries and Thank you to Sunway Putra Hotel for having this event. I hope many other companies would do the same, to acknowledge the efforts and sacrifices of these kind of people who live to serve and help other people. That's just so awesome. It's nice that companies are doing this to inspire people and to spread kindness as well. You don't see this everyday! Great job Sunway! And not to mention that this place is nice with a beautiful view. The place looks really elegant and they do have a nice a nice advocacy. Nice to see you still doing your fitness stuff here. I think it's a nice gesture for this hotel to honor the silent heroes. The media always focus on the big moves made by louder givers, but honestly, it's the small ones, the silent ones that are more sincere in what they do. The sentiment is good, but I hope they do not only do this on Christmas time. I also pray they will do this without fanfare or publicity. Then we can really feel the sincerity and corporate responsibility of this hotel. What a great cause. It's lovely to give back, and Christmas time is a great time to give. Cheers! Wah it feels very rewarding to receive like a royal treatment even for at least once in a year. This is a very great cause for people who deserve it most. I love the campaign. It's especially perfect for Christmas so you can really celebrate the VVIP night with loved ones. It's a great initiative to honour these people who have made a difference. Are there many places to visit outside this hotel? The most fun part about the hotel is the shops and malls around it!